Vision is arguably our most precious sense, with blindness severely affecting quality of life for millions of people, particularly the elderly. As the world's population ages, diseases affecting the retina such as glaucoma and macular degeneration have become the leading causes of irreversible blindness. Glaucoma affects over 60 million people worldwide. Blindness occurs through damage to the optic nerve, which transmits visual information from the eye to the brain. Reducing the eye pressure medically or surgically is currently the only treatment that can slow the progression of glaucoma, however visual deterioration continues despite treatment in many patients. There is an urgent need for new treatments that can prevent blindness in the most severely affected glaucoma patients, and restore some useful vision to those who have lost their sight due to the disease. As a clinician scientist glaucoma specialist, I see patients every day who are continue to lose vision despite maximum conventional treatment of their disease. My research group is based at the John van Geest Centre for Brain Repair where we are working to develop new treatments for degenerative eye diseases, using stem cells, gene therapy and other approaches to regenerate the injured optic nerve. I am lucky to work in an environment where I am constantly interacting with researchers working on other neurodegenerative conditions such as Parkinson's disease and Alzheimer's disease as well as other researchers working at the forefront of axonal degeneration research, spinal cord repair and remyelination. We share many interests and technologies as well as ideas in our joint quest to improve the lives of our patients. The ultimate aim of my work is to reduce the terrible burden of blindness caused by optic nerve diseases in the future. Neurotrophic factor signalling pathways have important effects on neuronal survival. 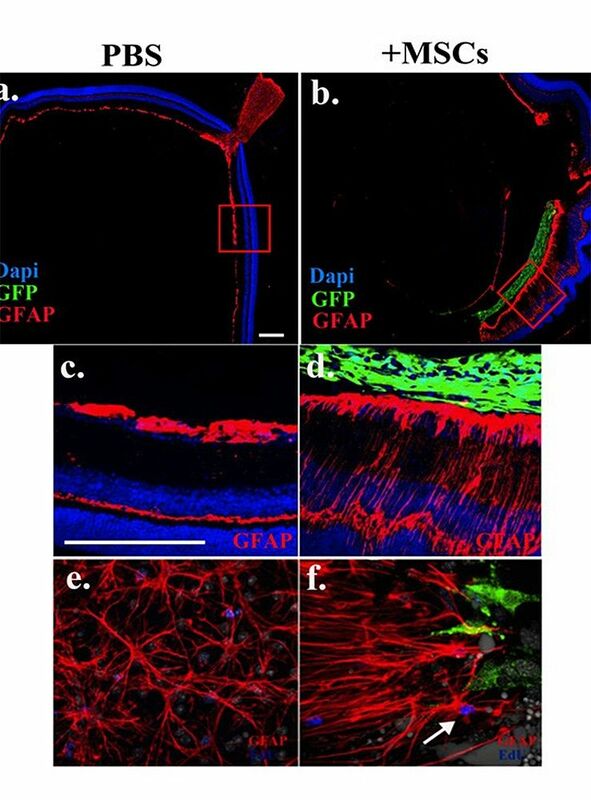 It has been shown that brain-derived neurotrophic factor (BDNF) delivery to the retina is reduced in animal models of glaucoma and that retinal delivery of BDNF by gene therapy can improved retinal ganglion cell (RGC) survival in experimental glaucoma, at least transiently. We have shown that human, mouse and rat cells can be targeted to produce BDNF and TrkB proteins simultaneously and that in animal models of optic nerve injury, treatment with both proteins is more protective than either given alone. Importantly, the use of gene therapy does not appear to have a negative impact on retinal health and the beneficial effects can be seen for long periods after a single treatment. A current major focus for the lab is to move a gene therapy strategy based on this work through to early stage clinical trials. Figure 1: Upregulation of the TrkB receptor throughout the mouse retina following addition of gene therapy vectors. Our lab is exploring many aspects of the pathogenesis of RGC loss in glaucoma. 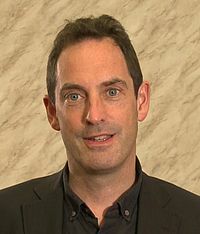 As an example, there is an increasing body of evidence that implicates dysfunction of a protein called tau in glaucoma. Tau is part of the supporting architecture and transport mechanism of neuronal cells and pathological changes in tau are mediated through abnormal modifications called hyperphosphorylation. The two main risk factors associated with glaucoma progression, namely increasing age and raised intraocular pressure, have been shown to increase tau hyperphosphorylation. Tau hyperphosphorylation has also been correlated with loss of retinal ganglion cell function, which is the main cell type affected in glaucoma and reduction in tau has been shown to confer neuroprotection in experimental glaucoma. This damage is likely to be mediated via the loss of stability of the supporting architecture of the cell and its projections called axons, with subsequent impairment of axonal transport, as well as the formation of neurotoxic aggregates. Although it is likely that transport blockade affects multiple essential intracellular components, of particular interest is the loss of retrograde transport of brain derived neurotrophic factor (BDNF) and its receptor TrkB. Restoration of BDNF locally to the retina via gene therapy delivery has been shown to confer neuroprotection in experimental glaucoma and BDNF has also been reported to modulate tau phosphorylation in neuronal cells via TrkB activation and the downstream PI3K/Akt/GSK3β pathway. We are exploring whether tau hyperphosphorylation can be reversed or prevented with overexpression of both BDNF and TrkB using viral gene therapy approaches and whether this improves axonal transport and RGC function. Another major focus for our lab is developing strategies to enhance optic nerve regeneration after injury. Damage to the optic nerve is often accompanied by an inflammatory response and formation of a scar. Components of this scar include proteins called chondroitin sulphate proteoglycans (CSPGs). CSPGs may promote or inhibit nerve growth based on the pattern of sulphur atoms attached to chains on the protein. We have been working to characterise the sulphation patterns of CSPGs at various time points after injury. We have characterised the spatial and temporal expression of CSPGs and their 4S sulphated epitope following optic nerve crush injury in mice (Figure 1). These experiments show that CSPG expression in the optic nerve primarily occurs between 3 and 7 days following injury, and persists for at least 3 weeks, creating an inhibitory environment that blocks axon growth past the lesion site. We are currently working to modify the levels of inhibitory CSPG at the injury site and enhance RGC axon regeneration. We are compare the effects of two enzymes on axon regeneration in the rodent optic nerve: one digests whole sugar chains from the CSPGs, another targets a specific sulphate pattern on CSPGs which may contribute to their inhibitory properties. By reducing the inhibition caused by CSPGs and combining with other strategies to stimulate RGC to regenerate, we aim to enhance optic nerve regrowth after injury for the benefit of patients in the future. Figure 2. Following optic nerve crush in mice, antibodies against CSPGs (CS-56) and 4-sulfated GAGs (2H6) were elevated at 7 days. Levels remained high at 3 weeks post crush. Mesenchymal stem cells (MSCs) are being explored as a potential therapy for many different neurodegenerative diseases. We have shown that MSCs are strongly protective in animal models of glaucoma. However, outstanding problems remain to be addressed, in particular the aggressive scarring response occurring in the host retina in response to transplanted donor MSCs. We have been working to characterize retinal glial response to intravitreally transplanted MSCs in order to identify potential factors able to modulate graft- induced scarring. As an example of our experiments, donor MSCs were transplanted into the vitreous of adult healthy mice and after seven days retinal tissue was harvested for investigation. Western blot and immunohistochemistry analysis were performed to explore retinal glial responses to transplanted MSCs. Signalling pathways potentially involved in graft-induced retinal reactive gliosis were identified by microarray gene expression profiling. We found that the host retina responds to donor MSCs by undergoing strong reactive gliosis characterized by retinal folding and detachment, up-regulation of intermediate filaments, microglia activation and recruitment of inflammatory cells called macrophages. It was shown by microarray gene expression profiling that STAT3 is among the top 25 most induced genes upon MSC transplantation. The JAK/STAT3 and ERK1/2 signalling cascades were shown to be the most responsive pathways to donor MSCs and activation of these cascades was confirmed to occur in retinal Muller glia. Lipocalin-2 (Lcn-2) was identified as potential new indicator of graft-induced reactive gliosis. As a result of this work, we have proposed a new mechanism where recruited macrophages play a key role in the inflammation observed after ocular stem cell therapy in the recipient retina (via the MAPK cascade and Lcn-2). 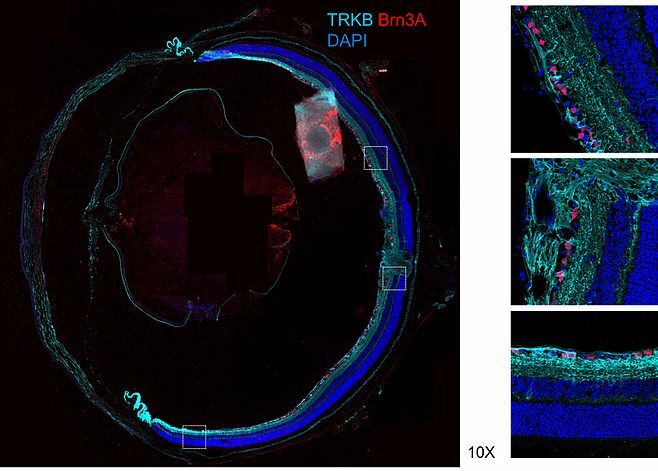 This mechanism provides a novel platform for further investigation into methods to reduce the scarring response following cell transplantation in the retina. The ultimate goal is to develop treatments that will improve the effectiveness of stem cell treatments in human eye diseases such as glaucoma and macular degeneration.